After visiting a few African countries on a personal tour, GM Maurice Ashley was deeply moved by the extreme poverty, natural beauty, and potential of the people he meet. 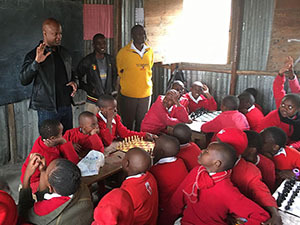 He decided to take action, and together with Graham Jurgensen, they enlisted the help and patronage of the Paul Allen Foundation, as well as the Kasparov Chess Foundation in the USA and Africa, to locate, educate, and train possible masters in African countries. This summer he will go to Rwanda and Namibia.